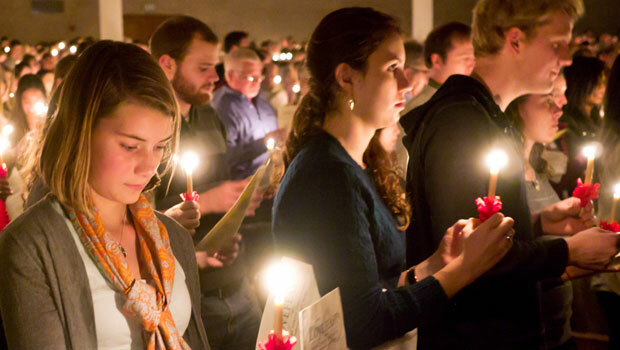 Following a tradition started by a student in 1965, more than 2,000 people gathered for the annual Christmas Lovefeast and Candlelight Service in Wait Chapel Sunday night. Students joined faculty, staff, alumni and community members to hear the Handbell Choir, the Flute Choir, the Concert Choir and a Moravian band. Chaplain Tim Auman led the service, which featured a message by Nathan O. Hatch, president of Wake Forest University. The Christmas Lovefeast and Candlelight Service is a custom that originated in Europe in 1747. The first lovefeast in North Carolina was held on the evening of the arrival of the Moravians at Bethabara in 1753.